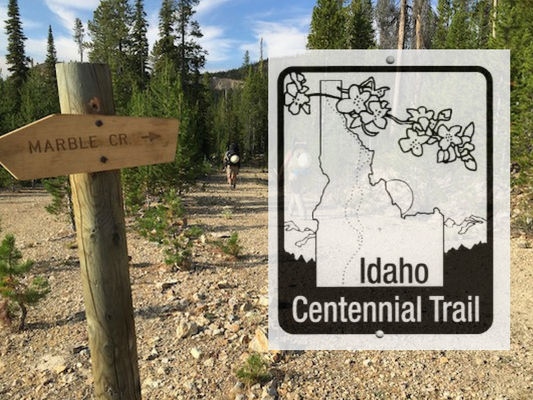 The Idaho Centennial Trail takes hikers 900 miles through some of Idaho’s most beautiful places. With the current rise in popularity of long distance hiking, it is high time that the ICT gets the recognition it deserves as one of America’s most rugged and remote hikes. But an increase in hikers means an increased need for stewardship, education, and awareness. The Idaho Trails Association has teamed up with local partners to help improve trail conditions for future hikers. 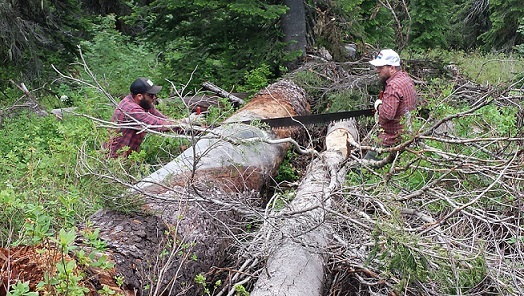 Coordinating with our long time backcountry allies, the Selway Bitterroot Frank Church Foundation, and Forest Service trail crews, over 50 miles of the ICT were cleared in 2016. Stewards of the trail cut hundreds of logs, cleared water bars and improved drainage, addressed some hiker hazards, and opened up trails that have been choked up for decades. It is with great pride that we return to areas of Idaho that have long since been overlooked, and where we are at risk of losing access to our wild places. We hope the growth of the Idaho Centennial Trail will create more interest and investment in our public lands, and lead the way for Idaho’s next generation of outdoor adventurers. Thom Klein is an ITA volunteer from Eastern Idaho who has made it his goal to hike the entire length of the ICT in sections. He has helped us coordinate presentations at Idaho State University, so we were happy to help him with a ride out of the Frank Church as he bagged his last miles of the season. 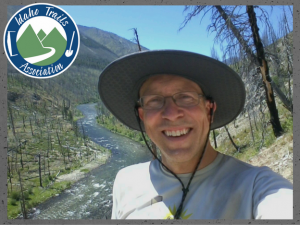 Congratulations Thom on a spectacular season of hiking and thank you for your contributions to the Idaho Trails Association. However, I was having trouble getting companions for the section into the Frank Church Wilderness, until Clay Jacobson, from the Idaho Trails Association, suggested that I hike in along the Middle Fork to meet a trail crew sponsored by the ITA and SBFCF, which was going to be working its way down Marble Creek, a notoriously difficult and overgrown portion of the ICT. I could meet up with the trail crew—however far they had gotten—and hitch a ride out. I enjoyed my walk first along Marsh Creek and then the Middle Fork, and had plenty of rafters at least for visual company. After two days, I found myself at the outlet of Marble Creek, and managed to score a large serving of steak fajitas from the party of boaters camped there. The next day, Marble Creek trail started out fairly clear. Occasionally, trail and creek would squeeze into a narrow gully, and then I had to push through undergrowth as I sang loudly to scare off any large animals. After the old Mitchell homestead, though, I began to see how Marble had gotten its reputation: with lots of deadfall and thick regrowth at creek crossings, it was easy to lose the trail. At one point, I found myself waste-deep in a beaver pond; at another, I had to cross a steep, unstable slide area with a 200-foot drop to the creek bottom. At last, late in the afternoon, I began to see signs of recent trail work and then came upon an immense log-jam which was obviously in the process of being cleared, with tools and helmets laid on one side. The contrast in the quality of the trail was like night and day, and I hurried ahead. I kept rounding corners and expecting to find the crew’s encampment (it was another four miles), but at last I spotted the tethered mules and shed a few grateful tears as I pulled in, just in time for a hot supper—and cold beer, of course. 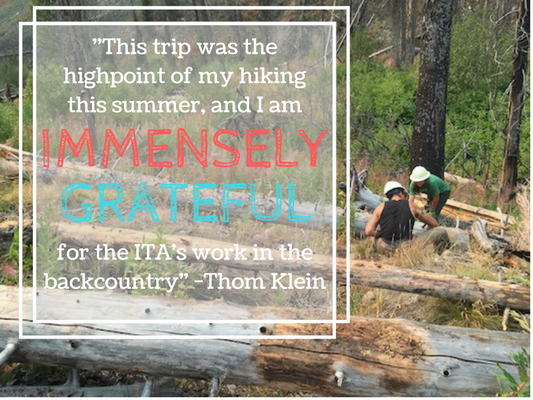 This trip was the highpoint of my hiking this summer, and I am immensely grateful for the ITA’s work in the backcountry, keeping these beautiful places accessible for those who don’t mind enduring some blisters—and maybe a brief meeting with a black bear. We invite you to join us in 2017 as we continue to make a positive impact in the Idaho backcountry. New trail work projects will be announced in the spring, but you can get involved right now by becoming an ITA member at whatever level is right for you. We appreciate all our members and could not do our important work without you. Thank you! 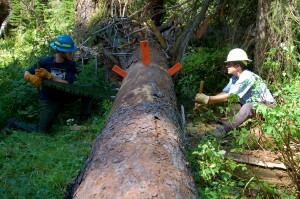 On Tuesday, July 26, eleven volunteers helped work on the final sections of the new Bee Top Connector Trail in the Sandpoint Ranger District of the Idaho Panhandle National Forest. This new trail will re-open access to the Bee Top/Round Top Trail #120 from the east end for the first time in many years. 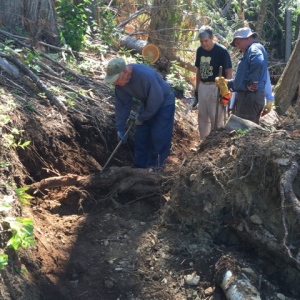 The ITA volunteers re-built a section of the new trail that had been destroyed in a storm last fall. We completed a by-pass trail around the damaged section, then dug out rocks and roots and did finish grading on about 1 ½ miles of the Connector. The eleven volunteers completed all the planned work in a single. An Idaho Conservation Corps (ICC) youth group working for the Forest Service was digging the very last ½ mile of the new trail ahead of our ITA volunteers. The ICC is expecting to complete that last section of the new Connector trail in August. Trail #120 is regarded by many to be one of the most beautiful trails in northern Idaho. It travels for 18 miles along scenic alpine ridge tops that are 4,000’ above Lake Pend Oreille. 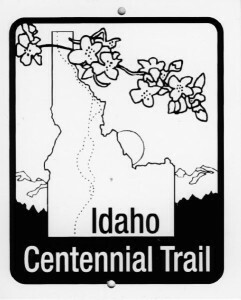 Trail #120 is also part of the 900 mile long Idaho Centennial Trail. 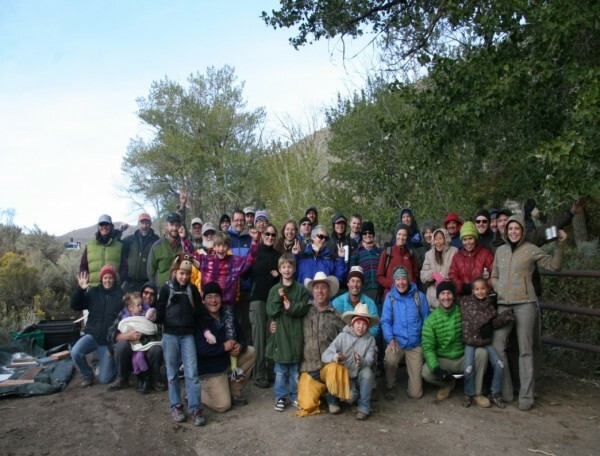 Boise Bureau of Land Management, Idaho Trails Association, and REI invite you to join us for some camping, projects, and activities for this year’s National Public Lands Day out in the Owyhee Canyonlands. Date: September 17th, 2016. Join us the evening of September 16th to campout or the morning of September 17th. Breakfast & registration starts at 9am, projects are from 10am-12pm, and lunch from 12pm-1pm. Site Location: Poison Creek Recreation Site is about 20 miles southeast of Grand View, Idaho. The drive from Boise takes about one hour and 15 minutes. From town of Grand View, head east for two miles on Highway 78 to access the Mud Flat Road. The last 5 miles of the drive is a gravel road. Poison Creek Recreation Site is the eastern gateway to three Owyhee Canyonlands Wilderness Areas and for driving the Owyhee Uplands Backcountry Byway (aka Mud Flat Road). Poison Creek Recreation Site is a staging area for backcountry adventure, but this shady oasis needs some TLC. Projects: Projects at this site include replacing pole fence, planting native plants, and trail work. Activities: Guest speaker, owls of the Owyhee’s. Make a bird house in celebration of Woodsy Owls 45th birthday. BLM will provide: Breakfast and lunch on September 17th and a National Public Lands Day 2016 shirt and an REI volunteer shirt. 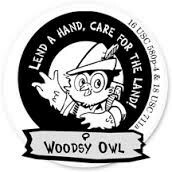 Youth receive Woodsy Owl stickers, coloring books, and patches. Please bring and wear shoes, long pants, sunglasses, and gloves so we can work safely. For more information: Please contact info@idahotrailsassociation.org or Dave Draheim @ Boise BLM (208)384-3358 or ddraheim@blm.gov. 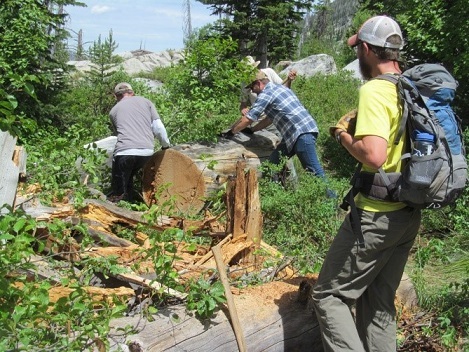 On July 2nd, 2016 ten volunteers donated 80 hours of volunteer time to clear the Hum Lake trail on the Krassel Ranger District of the Payette National Forest. We were met with clear blue skies, temperatures in the 60s and an empty Trailhead. We started off with introductions and a safety meeting to discuss the day’s events and proper and safe tool use. We ended up taking 2 crosscuts as we had 4 certified sawyers, pulaskis, shovels, loppers and the infamous Peavey. We split into 3 teams, 2 saw teams and the waterbar/brushers that did an amazing job of working on the drainage and cutting those bushes back. Overall we cleaned 47 waterbars, brushed 600 feet and cut 22 trees from the trail. We were able to have our ceremonial snowball toss at the Hum Lake pass, there is still a nice cornice slowly melting away. It was a great day that ended with light rain, cookies and drinks back at the trailhead. Thanks to the awesome crew that came out for this work party! 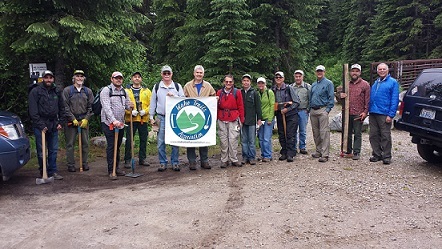 On June 25, volunteers with the Idaho Trails Association (ITA) completed maintenance work on the Beehive Lakes Trail in the Sandpoint District of the Idaho Panhandle National Forest. 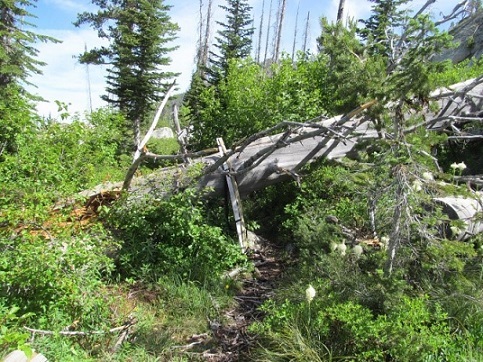 Fourteen ITA members and friends brushed out 4 ½ miles of trail, re-built or re-opened 43 water diversion ditches, and cut out 5 fallen trees that had blocked the trail. 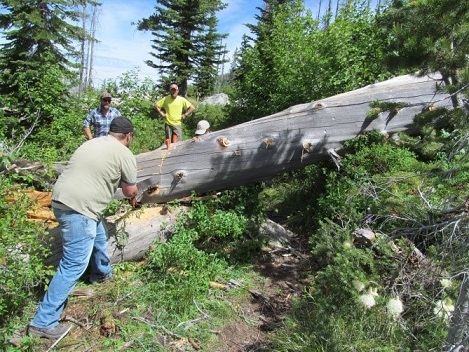 One of the trees we removed measured 36” to 39” in diameter, the largest ITA has done in our 6 year history of helping to keep Idaho’s hiking trails open for the public. In all, our volunteers spent about 130 person hours doing this work. The popular Beehive Lake trail is 4 ½ miles long and gains about 2,000’ of elevation before it ends at a beautiful alpine lake that sits just below the Selkirk Mountain crest. Our first trail work party of 2016 was another great success. 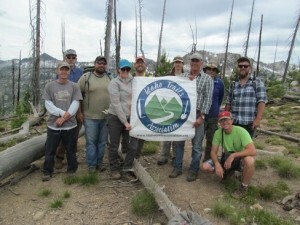 On Friday, April 29, eight volunteers helped the Idaho Trails Association (ITA) do maintenance work on the English Point Trail #80 in the Idaho Panhandle National Forest. The group cleaned out water bars, cut back brush, cleaned sod off of a raised walkway, and did other “spring cleaning” chores. The English Point trail system includes easy loops through forest terrain on the west side of Hayden Lake. The ITA volunteers maintained about 2 ½ miles of this popular trail, making it more enjoyable for the hikers, mountain bikers, and horseback riders who come here. The Forest Service had a crew go in ahead of our ITA volunteers to cut out the many large trees that had come down early last winter in a big storm. Our volunteers were then able to use hand tools to complete the re-opening of the trail. Our work was completed in one day with no injuries or other issues. We recommend having fun and exploring the English Point trail system! Marble Creek is in the Frank Church River of No Return Wilderness. Spend a week in one of the remotest places in the lower 48. ITA is partnering with the Selway Bitterroot/Frank Church Foundation to clear 13 miles of Marble Creek off the Middle Fork of the Salmon River. If you ever wanted to spend a week crosscutting logs from a trail this is the project! Supplies will be packed in by stock to the camp at Cottonwood Creek where we will spend our time opening a critical section of the 1000 mile long Idaho Centennial Trail. Meals will be provided. Please review our Volunteer Manual. If you have any questions please email them to info@idahotrailsassociation.org. This Trail Work Vacation is full, to be put on a wait list please email intern@idahotrailsassociation.org. Thank you for your interest in volunteering with us & we hope you will sign up for one of our other great projects! 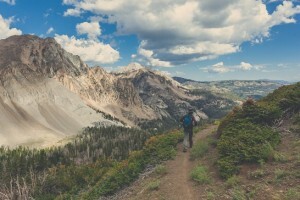 Spend seven days in the beautiful Sawtooth Wilderness working on the Alice-Toxaway trail nestled amongst the 10,000 foot peaks of the Sawtooth Range. Your gear will be packed into a base camp by Mule train. We will meet at the Tin Cup Trailhead at Pettit Lake on Sunday July 17th to hike into camp at Toxaway Lake. We will hike in on Sunday July 17 to our base camp at Toxaway Lake. Monday we will start working on the trails around Toxaway Lake and to the trailhead at Tin Cup. We will teach you how to clean waterbars, how to cut logs from the trail with Crosscut saws, cut brush back and how to rebuild trail tread. We will also be working on removing rocks and repairing rocky sections of the trail and creek crossings. Meals will be provided and cooked by ITA Chefs. Maximum number of volunteers 8. This is one of the most scenic trail projects in the nation, sign up early as only eight spaces are available! Please fill out the form below if you are interested in participating on this project. Because this is a week long supported project, ITA requires a $50 per person refundable deposit to secure your spot. This will help us ensure that everyone who registers is well-intentioned and we will not have to bear the costs of last-minute cancellations. By submitting this registration, you agree to donate the deposit if you cancel with less than 2 weeks notice. After completing the sign-up information on this page, you will be redirected to a secure site to make your deposit with PayPal or Credit Card. An ITA representative will get back to you with more information. This Trail Work Vacation is full, to be put on a wait list please email intern@idahotrailsassociation.org. Thank you for your interest in volunteering with us & we hope you will sign up for one of our other great projects! Ants Basin. Seven days in the White Clouds Wilderness! We will hike into the base camp in the upper meadows of Warm Springs Creek on Sunday August 7th. This project is focusing on the trails in Ants Basin/Born Lakes and Warm Springs Creek. We will be camping at the upper meadows in Warm Springs Creek and doing day hikes to improve the trails in the area. Meals are provided and cooked by ITA volunteer chefs. This project is currently full. If you have questions please contact info@idahotrailsassociation.org. This Trail Work Vacation is full. Thank you for your interest in volunteering with us & we hope you will sign up for one of our other great projects! Photos Courtesy of Peter Lovera. 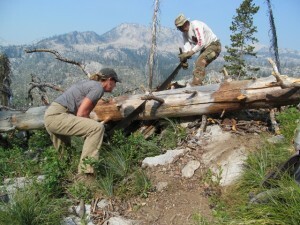 Work details: Join us for a day high in mountains above McCall clearing the trail between Duck and Hum Lakes. We will meet at the Duck Lake Trailhead at Lick Creek Summit at 9am Saturday, July 2nd. 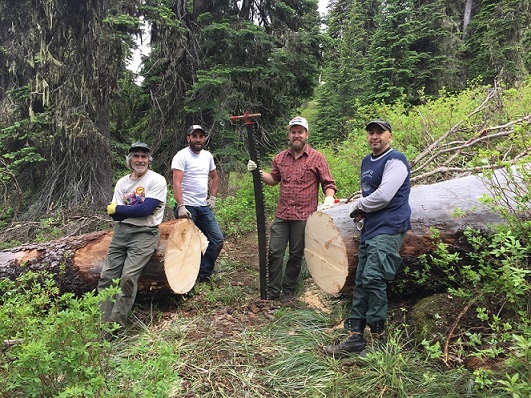 We will hike up to Hum Lake junction and start clearing the trail to Hum Lake with crosscut saws. 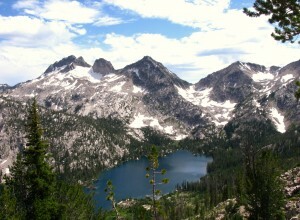 Our goal is to make it the 2 miles over the pass and down to Hum Lake. This is a strenuous hike at high elevation, but well worth the effort! Snacks and drinks will be provided at the end of the work day, but be sure to bring a daypack, jacket, gloves and your lunch and water! Let’s have fun and be safe. This project is difficult physically as we will be at higher elevation and climbing over a high pass in the time we will be working (9am-3pm) and the hiking distance (6 miles round trip) involved. Volunteers needed: 10 volunteers. If your plans change and you cannot make it. Please notify us & attempt to fill the project with another volunteer. When/Where: We will meet at the Duck Lake Trailhead at Lick Creek Summit at 9am. We will have our safety meeting, sign in and then head up the trail. We should be back to the trailhead by 4pm. What to bring: All volunteers should bring their own small pack with lunch, snacks, sunscreen, and water. Volunteers should have hiking boots, leather work gloves, and eye protection (sunglasses or safety glasses). ITA will provide the crosscut saws for the project.